Join Unit 42, the Palo Alto Networks threat research team, for a special session on Scarlet Mimic. Our cybersecurity experts spent the last 7 months researching this prolific cyber espionage campaign, with malicious activity stretching back 4 years. Targets range from human rights activists to government organizations to academic institutions across multiple countries. 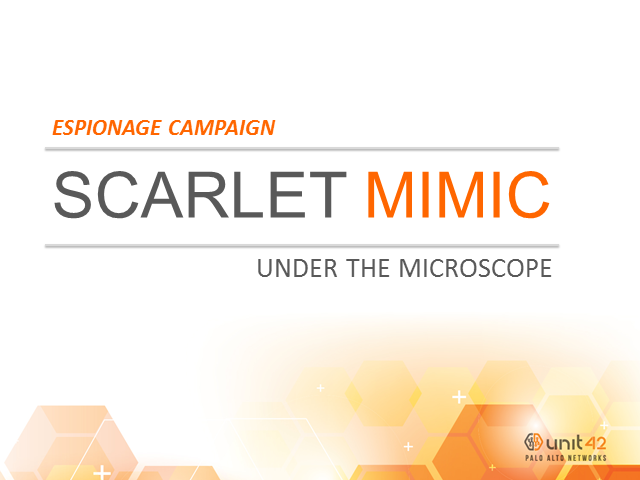 We will detail Scarlet Mimic’s attack methodology, including the sophisticated tools, techniques and methods employed by the adversary. Using this information, you can ensure your organization is not at risk and employ new security controls to prevent future, related attacks. • Understand the attack campaign flow. • Review the targets and who is at risk. • Dive into the malware and other tools used. • Learn indicators and strategies for prevention.